Eva Longoria (Desperate Housewives) stars in this big, fun and flashy half-hour comedy as Ana Sofia, the star of a popular Spanish language soap opera. One problem, she doesn't speak any Spanish. Other problems? Ana must manage a new boss, jealous castmates and high-maintenance best friends — and that's all before her ex-husband is hired as her new on-screen love interest. Just like a real telenovela, this comedy is full of all kinds of drama, including love, hate, life and even death! Despite all the chaos, this telenovela's cast and crew is a family ... or, at least, they try to be. Eva Longoria (Anna Sofia) is a Golden Globe-nominated, Screen Actors Guild and ALMA Award-winning actress, producer, director, entrepreneur, philanthropist and of course is best known as Gabrielle Solis on Desperate Housewives. Longoria is additionally executive producer of Lifetime's hit one-hour dramedy Devious Maids. The show follows the trials and tribulations of five Latina women who work as maids in Beverly Hills and was just renewed for a fourth season. It was also recently announced that she will be producing two more projects for NBC — the comedy Bonita & Mechelle, co-produced with Will Packer, and an untitled Texas Ranger comedy. Longoria is set to star opposite Oscar nominee Demian Bichir in the feature film Low Riders, which looks at the lives of enthusiasts of the re-emerging low-riding culture in Southern California's Latino communities. Longoria also recently starred in the feature films Refugio, Any Day, alongside Sean Bean and Kate Walsh, and the critically acclaimed feature film Frontera, co-starring Michael Pena and Ed Harris. Longoria also recently guest starred in the Golden Globe Award-winning comedy series Brooklyn Nine-Nine. Before she was famous she appeared on LA Dragnet and on The Young and the Restless. Jencarlos Canela's (Xavi) first TV role was in Telemundo's soap opera Pecados Ajenos. That propelled him to sign an exclusive contract with the network for which he has co-starred in several Spanish-language productions. Univision extended an invitation for Canela to join their esteemed panel of judges for popular reality show Nuestra Belleza Latina. Soon after, Univision joined forces with Televisa Network in Mexico City to create a reality show called Va Por Ti, featuring Canela. Diana Maria Riva (Mimi) has established herself as a dominant force in television, film and theater. On the big screen, she most recently starred in McFarland, with Kevin Costner and Maria Bello, and Love and Mercy, with Elizabeth Banks and John Cusack. Riva also had a supporting role in the critically acclaimed film Short Term 12. In 2010, she starred opposite America Ferrera in Family Wedding and has also appeared in 17 Again, What Women Want, Employee of the Month, Chasing Papi and The Third Wheel, among others. On the television side, Riva was most recently seen in FX's Saint George, with comedian George Lopez, and simultaneously recurred in FX's The Bridge, starring Diane Kruger. Other prominent series in which Riva has appeared include Sabrina, the Teenage Witch, City of Angels, NYPD Blue, Everybody Loves Raymond, The West Wing, Studio 60 on the Sunset Strip, Less Than Perfect, The Hughleys, The Drew Carey Show, Strong Medicine, The X-Files, The Pretender, Party of Five, The Ghost Whisperer and In Plain Sight. Amaury Nolasco (Rodrigo) has guest starred on several popular television shows, including CSI, ER and George Lopez before landing his first major supporting role on the big screen hit 2 Fast 2 Furious as Orange Julius. In 2005, Nolasco solidified his Hollywood acting career with his series regular role as Fernando Sucre on the critically acclaimed series Prison Break. Nolasco recently had a recurring arc on Gang Related. He's had previous roles on the sitcom Work It, Justified, Rizzoli & Isles, Southland and Burn Notice. Jose Moreno Brooks (Gael) starred in MTV's One Bad Choice as Stephan Perez in the retelling of his true-life story. Other credits include a guest star on Nine Lives of Chloe King, as well as roles on The Game and Big Time Rush. Jadyn Douglas (Roxi) started pursuing acting in 2011 while living in New York. In 2012 she was cast in the independent film Greetings From Tim Buckley, starring Penn Badgley. Last year she played a murdering con artist on NBC's drama Taxi Brooklyn and was also cast in the Andrew Levitas drama Lullaby, alongside Amy Adams and Garrett Hedlund. Alexandra Meneses (Isabella) first became embraced by audiences playing Teresa Morales in Dr. Quinn, Medicine Woman. Her role as Stefania Fogagnolo — Brad Garrett's luscious Italian girlfriend on Everybody Loves Raymond -- earned her ALMA Award and American Comedy Award nominations. Other TV roles include Joey Tribiani's sister Cookie on Friends, Sofia on The Goldbergs, CSI, CSI: Miami, Prison Break, NCIS, Psych, Austin & Ally and The Cleveland Show. On film, the Chicago native and former model appeared in Selena, Boyle Heights and the New York Film Critics Circle Award-winning Auto Focus. Izzy Diaz's (Issac) credits include Parenthood, Austin & Ally, Lost, Rules of Engagement, Workaholics and Happy Endings. On the big screen, Diaz appeared in Brian DePalma's Iraqi war drama Redacted. We received four episodes for review. The review will be based on these four episodes. Ana Sofia (Eva Longoria) is taken by surprise when her ex-husband, Xavi (Jencarlos Canela), joins the cast of her popular telenovela. With the help of her best friends and co-workers, Mimi (Diana Maria Riva) and Gael (Jose Moreno Brooks), Ana Sofia sets out to prove that she is still in charge. Ana Sofia (Eva Longoria) doesn't like her co-workers having secrets and tries to implement an "open book" policy at work. Things get crazy when a surprise workplace romance and a surprise visitor put that policy to the test. We also watched the episodes "The Kiss" and "The Rivals," both set to air in January, but no official airdates are given yet. Eva Longoria is back on network TV in a regular series and it's great! This is a show made for her to star in and she delivers on all comedy aspects -- such as comedic timing and physical comedy. She was the comedic genius on Desperate Housewives and was reliable for laughs on every episode of a dramedy like that. Now she has a true comedy and can show off all of her comedy chops. Her character of Ana Sofia Calderon has lots of similarities with Gabrielle Solis (her DH character) and that's a good thing. On this show, Eva plays a telenovela actress who is nothing really like the character Pasión that she plays. It's a great workplace comedy and with lots of silly (but in a good way) laughs. Eva works well with all of the supporting cast on this show. In the pilot plotline, her character is worried that she may have to share top-billing with the new addition to the cast (hilariously her ex-husband), but Eva doesn't have to worry here because she is the show. Back to the supporting actors, after watching four episodes we are pretty invested and know these characters. I feel all of the characters so far are unique and crucial to the show. So far I think Isaac might be the weakest, but I'm sure some good plotlines are to come for him. I think in future episodes there will be a love triangle between Ana Sofia, her ex-husband & now co-star Xavi and the network boss (recurring guest star Zachary Levi). The episodes with Zachary I found were the best ones ("Pilot" and "The Kiss"). I watched the episodes after the pilot in somewhat out of order and it doesn't seem the storylines are serialized, so you can watch the show at any point, unlike a real telenovela. As of now, we see Ana Sofia with her colleagues, but not family yet. Maybe that will be tackled at some point, such as maybe her DH husband Ricardo Antonio Chavira? We can confirm that he will indeed guest star this season! Anyway, this show is just good old funny with the natural funny Eva Longoria. And it's funny that her character doesn't speak any Spanish either. Telenovela has it all, the glitz, the glamour, the hilarious plotlines and...a wind machine! Even a fake TV network, VivaVision. It may be a mix of 30 Rock and the classic sitcom Soap, if that makes sense. The series will be paired with another fan favorite star (America Ferrera) so it's NBC's new comedy duo hour come January. The recipe for a good comedy and show is to always include Eva Longoria. She is that funny in this show. Because if viewers don't tune in, well we will just have to give you the...telenovela...stare-down. It's just plain old fun and a good time. No translator needed for this show. Discuss the show after you watch it on Monday, December 7, 2015 at 10:00PM & 10:30PM ET/PT on our message board. I Get That a Lot, featuring popular stars pulling funny pranks on everyday people, returns with a new installment in a continuing series of one-hour specials, to be broadcast Wednesday, Dec. 30 at 8:00PM ET/PT on the CBS Television Network. 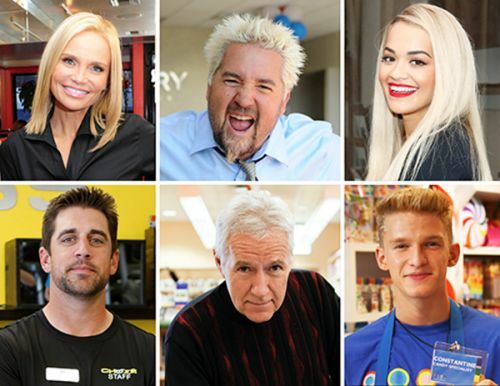 Celebrity participants include actress and singer Kristin Chenoweth working as a waitress at a New York diner; restaurateur, author and television personality Guy Fieri selling cars; singer Rita Ora working at a tanning salon; Green Bay Packers quarterback Aaron Rodgers working the front desk at a gym; Australian pop sensation Cody Simpson selling candy; and Jeopardy's Alex Trebek behind the information desk at a public library. This is the first special to air since early Jan. 2013. I Get That a Lot features celebrities tricking everyday citizens in cases of supposed "mistaken identity." Working ordinary jobs, these celebrities confuse customers who can't decide if it's the actual celebrity or an astonishing look-alike. As these celebrities continue to deny their true identities, various reactions from their customers elicit exasperated and hilarious responses.